Fundamental changes in what drives U.S. dairy industry prices are happening quickly. The changes from fluid milk to processed products like cheese and yogurt have been going on for decades. The change from a domestic market to global market is newer, and more complex. The focus of this post will be Nonfat Dry Milk (NDM)/Skim Milk Powder (SMP). The amount of NDM/SMP produced is growing as fast or faster than yogurt or cheese. The big difference is that the majority (52% YTD) is exported. That means that the price is not determined domestically, but internationally. 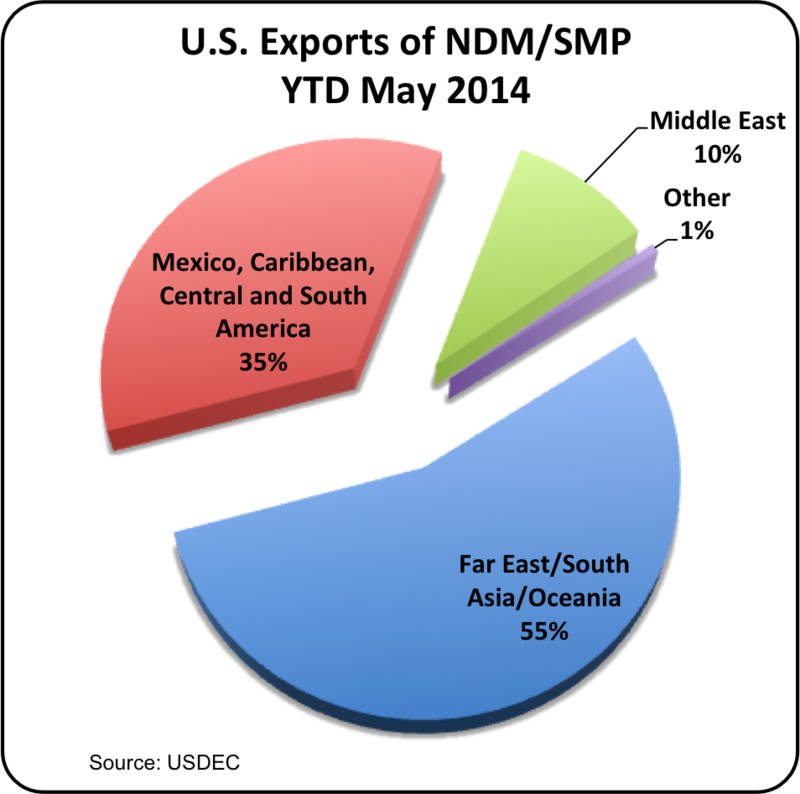 In 2013, the U.S. became the world's leading exporter of NDM/SMP. In the first four months of 2014, exports continue to be very strong reaching a monthly record export level of 60,358 metric tons in May. 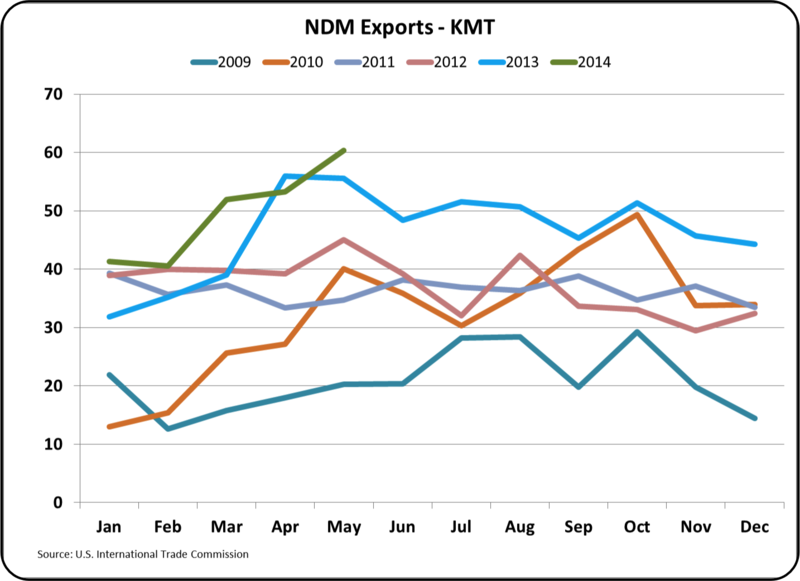 For the first five months of 2014, exports have averaged 48,011 metric tons per month, 10% above 2013 levels. 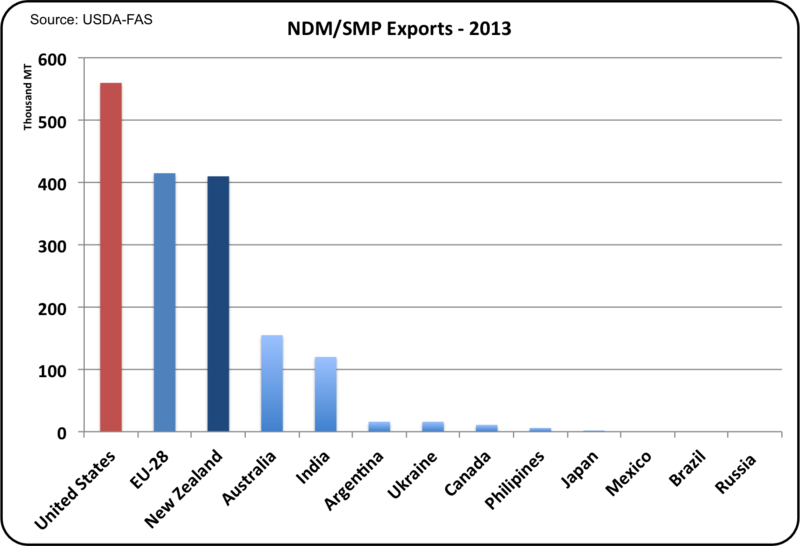 It appears that the U.S. NDM/SMP exports will maintain a leadership position in 2014. The majority is being exported to Asian countries, half way around the globe. The big competitors to supply this market are Europe and New Zealand. Obviously, New Zealand has a freight advantage when exporting to the Asian markets and Europe had the advantage of being the leading exporter in the market for the last three years. 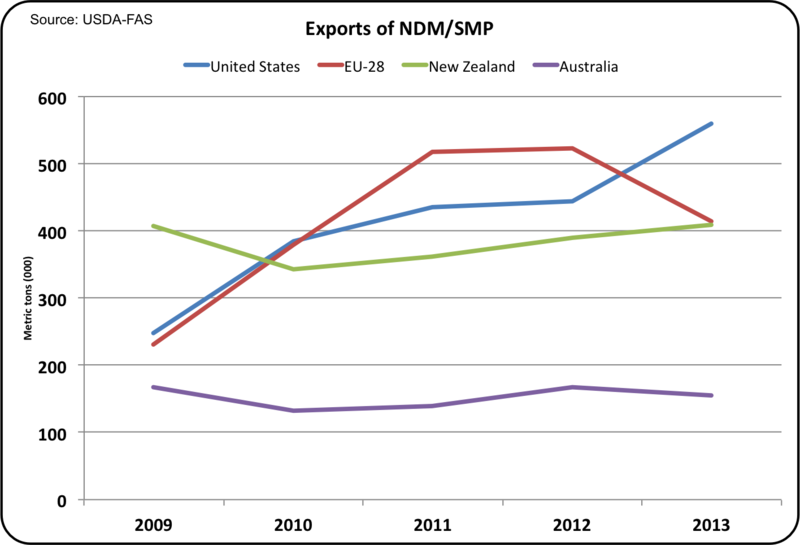 In spite of these advantages for New Zealand and Europe, the U.S. significantly expanded exports of NDM/SMP to the Asian markets in 2013 and became the leading global supplier. Country by country exports for 2013 can be seen below. The top three are the strong contenders for this market. Australia is a smaller player and India's participation in this market has been sporadic. 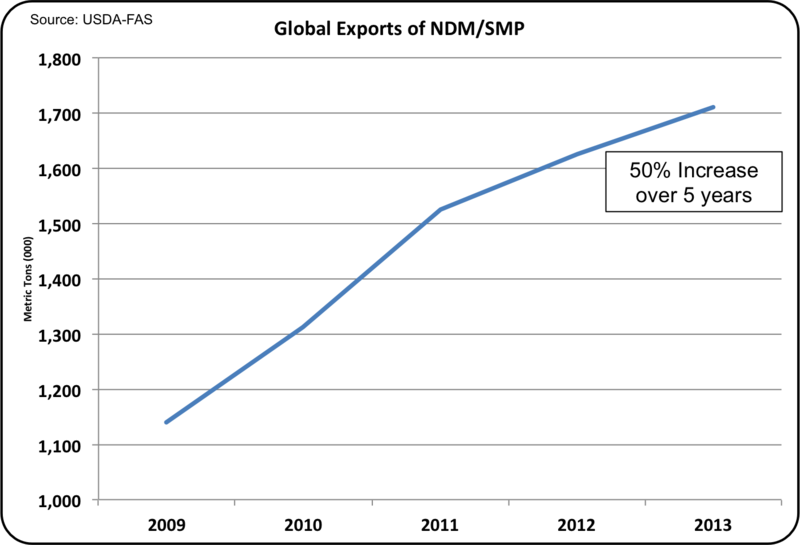 The total export market for NDM/SMP has increased steadily, growing by 50% over the last five years. There is a significantly growing global market and the U.S. has become the leader. Can it continue? The U.S. has a very diversified list of customers. The sales to Mexico, the Caribbean, and South and Central America represent long-term customers who are not easily served by the EU or New Zealand. However, the majority of exports go to the other side of the world where there can be significant competition from the EU and New Zealand. Prices for NDM/SMP are determined globally, not domestically. The chart below shows the comparative prices for U.S. west coast (where NDM/SMP is exported to Asian countries) vs. Oceania. This essentially compares U.S. West coast export prices to New Zealand's prices. Both prices are FOB the export location. This data shows that prices are falling and that the U.S. prices may be overpriced currently. It also shows that the U.S. West coast pricing is tied to the global markets. WHAT DOES THIS MEAN TO U.S. MILK PRICES? The NASS prices are used in many of the U.S. formulas for milk pricing. The chart below shows the NASS price vs. the West Coast prices for NDM/SMP. They are virtually identical. This is the next step in the logic of tying U.S. prices to the global market. 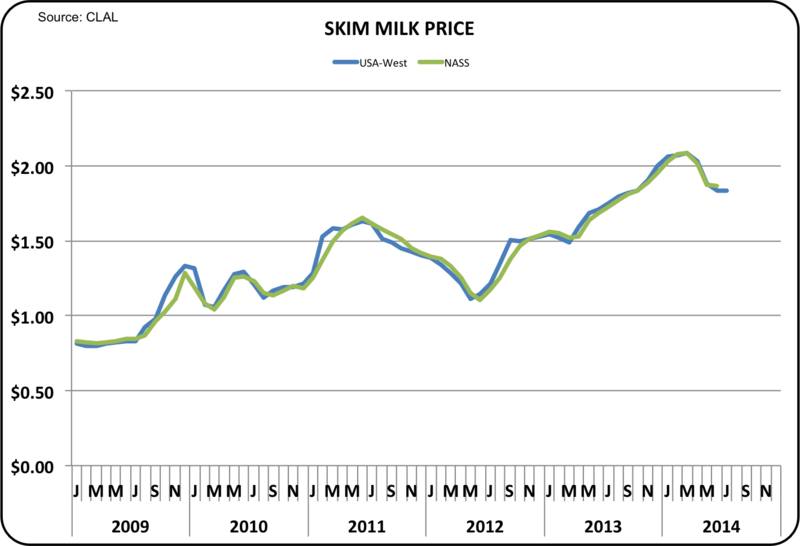 The price of NDM/SMP is the basis of Class IV skim milk pricing. The Advanced Class IV price is calculated like the component Class IV price with slightly different timing in the determination of the NASS NDM price. Class I skim milk is based on the higher of the Class III or IV advanced pricing. 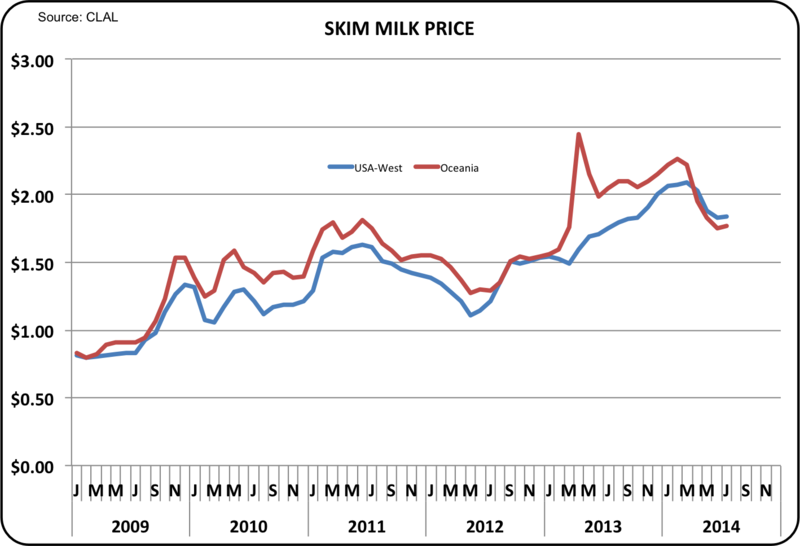 As reported in the prior post, Class IV skim milk price is running above the Class III skim price most of the time. This means that producers paid on the advanced system are receiving a higher price for their milk because of the global NDM/SMP prices. That means that producers paid on the component system receive a higher producer price differential because of global NDM/SMP prices. The majority of California producers are partially paid based on the higher price of NDM/SMP on the global market. See the February 15, 2014 post to this blog for more details. NDM/SMP has clearly entered the global market. How long will it be before cheese and butter are based on global conditions? To some extent they are now, just not to the extent of NDM/SMP. This is a game changer for U.S. dairy producers. It does increase volatility in U.S. milk pricing. It does increase the importance of dairy components, especially protein. What is the key to success in this environment? Being the low cost producer globally is the next challenge for the U.S. dairy industry. Võng tự đưa hay võng điện cho bé hay võng đưa em bé giúp bé ngủ ngon mà võng đưa tự động không tốn sức ru võng của bố mẹ. Võng tự động hay máy đưa võng tự động chắc chắn, gọn gàng, dễ tháo xếp, dễ di chuyển và may dua vong dễ dàng bảo quản. Lợi ích mà máy đưa võng vô cùng thiết thực.